I fell in love with a scrapbook set of papers with a Japanese theme a couple of weeks ago. It had the usual back up accessories, like chipboard pop outs, stickers and alphabets. The little geisha and the bird were two of my favorite images from the set so I put them together. 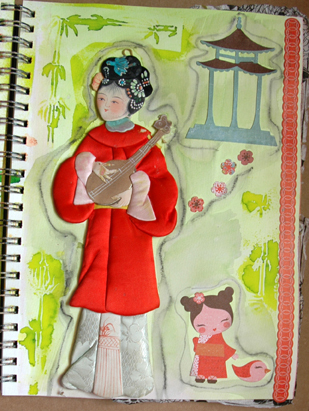 I was out in the garage and found this very stuffed but flat backed geisha doll and wondered if it is possible to go THAT 3-D in an art journal. Well, it is but with some caveats. First of all, your paper needs to be up to the task of holding the piece in place. This is my new go to Montval watercolor paper journal (90#) from Canson (the All Media I’ve already spoken of several times). The paper is pretty heavy, so that wasn’t a problem. Also, I set the found object geisha toward the spine, which would be my second suggestion: placement on the page. Third issue is that I forgot that this wasn’t a “stand alone” project like so many of mine are…soooooo, it is a tad tough to journal on the preceding half dozen pages. They are all lumpy. Because the top of the geisha is all stuffed and junk. So keep that in mind. One thing that would be SMART, so it never occurred to ME, would be to plan to have the stuffed geisha on the page but not actually PUT it on the page until you got any page effected by it finished, like the previously discussed preceding half dozen pages. Duh. Anyway, learn from my mistakes, grasshoppah. Don’t let the 3-Dness of an item immediately negate the idea of it in your art journal, but take my advice and do a little planning first. Think how it’s going to effect the rest of your work nearby. By the way, at the National Scrapbookers Day event I demo’d at this past Saturday, this page was popular. It definitely offers the unexpected as you flip through the book. p.s. 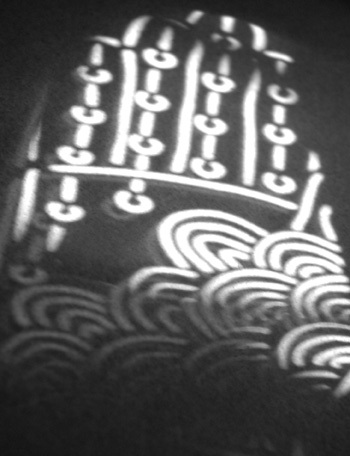 Bamboo was stenciled with Dylusions ink. Awesome. A simple grid over a two page spread became the foundation for these calendar journal pages. The upper left box contains a Crafter’s Workshop stencil image sprayed with Dylusions spray ink. I love dandelions and couldn’t wait to use this stencil. I hope you can at least see some of the watercolor effect the Dylusions spray ink had, and I love the intermixability of these inks. As you can see not each square of the grid has journaling. I used scrapbook paper scraps and turned the dandelion stencil wet side down after spraying the main image to get color on the right bottom center and right near bottom square. I do not like wasting ink!! Because the stencils are plastic the overspray stays wet a long time and it can be monoprinted onto any other page or project you have going. I put an opened up cardboard slide holder on the bottom right square and stamped “April” on the bottom right with what I believe is a 7 Gypsies journal rubber stamp set. 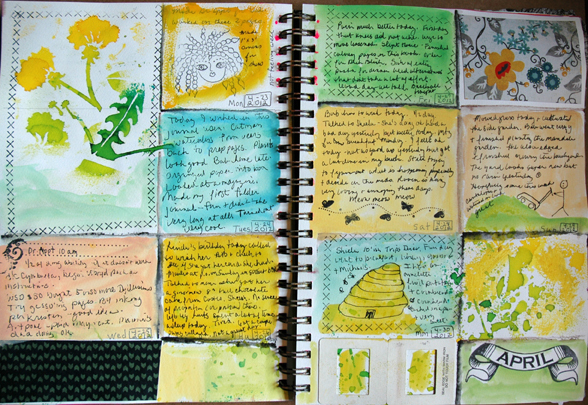 I liked prepping and using this spread so much that it is now the second class in my Art Journal series beginning in a couple of weeks at Whim So Doodle in St. Pete. Prepping is easy. Draw the grid, watercolor into each square by mixing your colors and making each square a different color, spray some with ink, use a stencil that you like that goes along with the month you are working on. Or draw or doodle into squares to make it even more personal. Pick a square to stamp your month into, use a box style to write the date in each square that will be for journal writing. Put something cool in the remaining squares for visual interest. Then every day all you have to do is show up with a pen and write a few sentences into the appropriate square. Easy peasey. 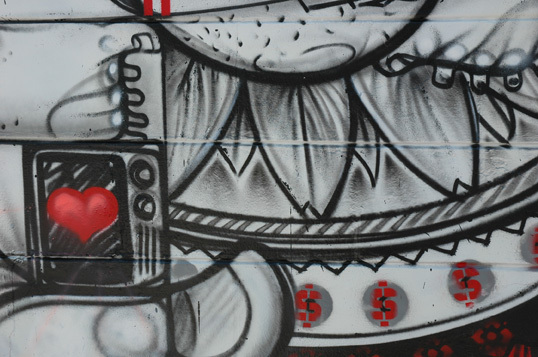 I really love this small portion of graffiti I shot more than a year ago on the side of a building where artists were allowed to paint. It was a montage of several artists but I enjoy the composition of this picture and took tight shots of pieces rather than the whole wall. There is such an elegance in the line and the grey, white, black and red color scheme, and I like the stenciled dollar signs in contrast to the sweeping sprayed lines of paint. Unfortunately, the wall is now blank and I was glad I documented the art while I had the chance. This blurred line art reminds me of the capability that the Stabilo All pencil has for making a watercolor-like line with graphite. In other words, this look could be replicated in our journals with a bit of practice. Cool to think about. Perhaps these should be called Shadow Lites rather than shadowlets. Caused by sun randomly striking my kitchen countertop in the afternoon while some mehndi stencils were out for use. After the first one I set some up, some stencils worked better than others. I like how there is actually a shadow of the shadow working in this one in some spots. I’ve spoken about shadow play before and I urge you again to watch for opportunities to capture random patterns that occur anytime the sun is in the correct position and angle. Just the other day I captured Count Dracula on the paper supply in my printer. The sun came through and shadowed the paper holder in such a way as it looked like a vampire with a cape. I’ll show you that one if it came out, at a later date.